You can view a poster in .pdf format about BRDF modelling prepared by J. Cierniewski and T. Gdala. This document decribes research on this subject. You can also download .jpg version of this poster. 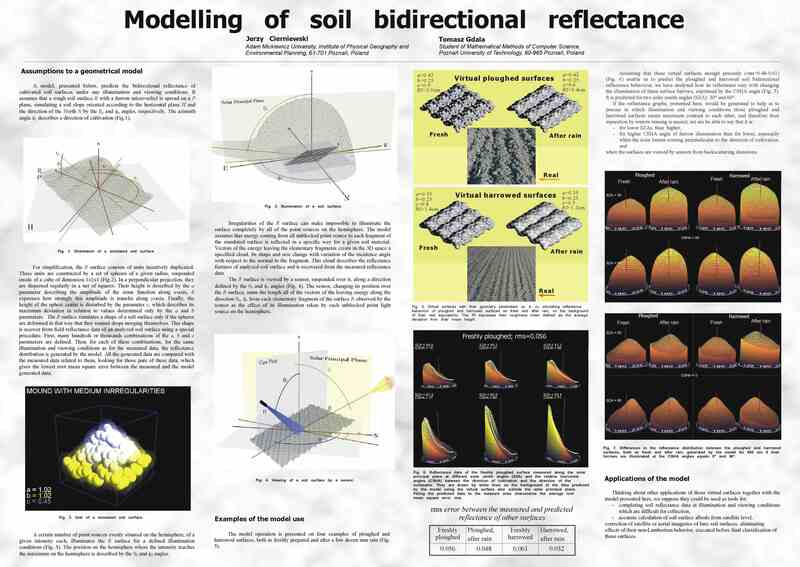 Furrow Microrelief Influence on the Directional Hyperspectral Reflectance of Soil at Various Illumination and Observation Conditions prepared by J. Cierniewski i M. Guliński, presented in Valencia, Spain, 2009. Use of undisturbed and artificial soil samples for the BRF laboratory measurements of cultivated soils complementing the measurements acquired in the field - prepared by J.Cierniewski J. Piekarczyk, M. Gulinski, S. Królewicz and B. Zagajewski (University of Warsaw), presented Third Workshop on Hyperspectral Image and Signal Processing, Lisbona, 2011. APPLICATION OF DIFUSE SPECTRAL REFLECTANCE DATA FOR ASSESSEMENTS OF SOIL PROPERTIES - prepared by C. Kaźmierowski, J. Piekarczyk, J. Cierniewski, K. Kuśnierek, S. Królewicz, H. Terelak, T. Stuczyński and B. Maliszewska-Kordybach, presented during international conference Protection of agricultural soils against joint stress of natural and anthropogenic factors , 13th - 16th June 2011, Puławy, Poland. Relationships between soil properties of the abandoned fields and spectral data derived from ASTER image - poster presented by J. Piekarczyk, C. Kaźmierowski and S. Królewicz during 5th International Congress of the European Society for Soil Conservation, June 25-30 2007, Palermo, Italy. Indirect estimation of plant-available water limits in selected soils of Wielkopolska Province (Poland) - poster presented by C. Kaźmierowski during 5th International Congress of the European Society for Soil Conservation, June 25-30 2007, Palermo, Italy. Królewicz S., Dzieszko P., 2011. Evaluation of DSMs quality based on various kinds of digital images. State of the Art and Trends in Airborne and Land Mobile Mapping Technology. 13 – 16 June, Cracow, Poland. ISBN:978-83-61576-15-0. 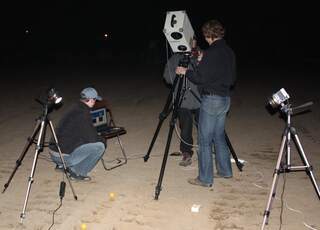 Mapping the soil organic carbon content using hyperspectral data. J. Cierniewski, K. Kuśnierek, ~16000$. Hyprespectral reflectance properties of soils in Poland. J. Piekarczyk, collective, ~ 87000$. Indirect estimation of hydraulic properties of Polish Lowland soils. Remote sensing method for identification of fallow and wastel and former farmland. roughness coused by soil aggregates and microrelief. 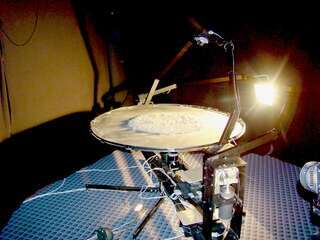 photographs in variable illumination and viewing conditions. 6 field albedometers with dataloggers to measure daily albedo from soil surface. 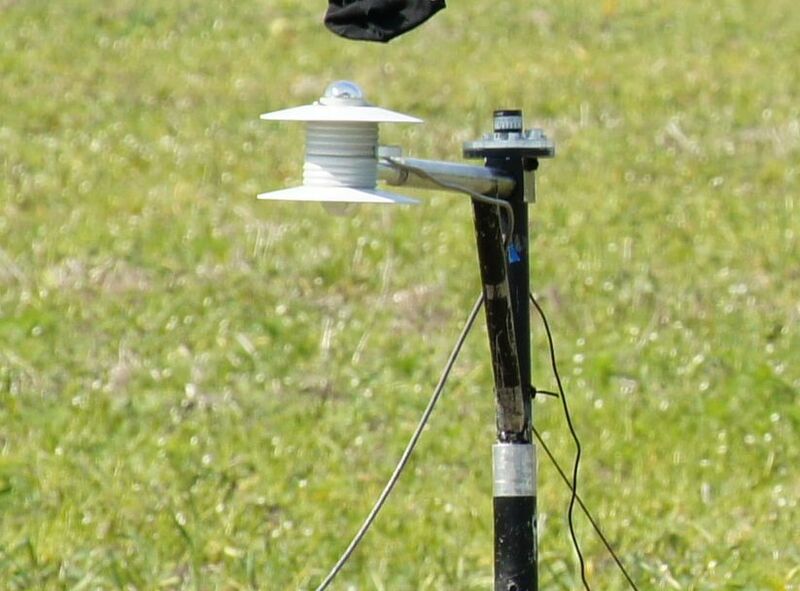 Tension disk infiltrometer for field measurements of unsaturated hydraulic conductivity (original construction based on Perroux and White 1988) and ponded single-ring infilrometers for water infiltration rate (field saturated hydraulic conductivity). Continous field soil moisture determination. Soil water retention characteristics is determined in undisturbed core samles using sand-box tank method (Eijkelkamp) for matric potential up to 100 kPa (wet region), in pressure chambers on 1 and 5 Bar ceramic plates (Soil Moisture Equipment Corp.) for potentials between 100 and 500 kPa and vapour equilibrium method in dry region (>1500 kPa). Determination of soil organic carbon and tatal nitrogen using block digestor. 5 laptops for field and personal use. Strona odwiedzona razy od 2011-11-07.